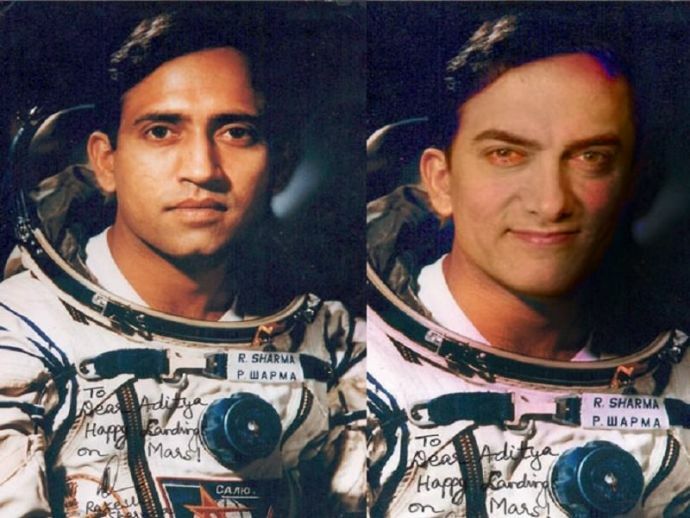 'Saare Jahaan Se Achcha': Aamir's Biopic On Rakesh Sharma Finally Gets Its Title! Then Prime Minister Indira Gandhi had asked Rakesh Sharma how India looked from outer space and the astronaut had said, "Saare Jahaan Se Achcha." The perfectionist, one year-one movie star Aamir is all set for another biopic as soon as he wraps up the post film commitments of Dangal. This time around, Khan will play Rakesh Sharma, the first Indian astronaut to go to outer space. Rakesh Sharma flew aboard Soyuz-11 in April 1984 to put India on the world's space map. The 67-year-old Sharma is an Ashok Chakra awardee and has promised to help the makers in the writing process of the film, sharing his experience and goodwill. The movie is going to be produced by Ronnie Screwvala's new production company RSVP and will be directed by Mahesh Mathai of the 1999 film Bhopal Express fame, which was based on the 1984 Bhopal gas tragedy. The movie was announced back in September but the title was recently finalised. When asked for its disclosure, the sources said, "Since it's a biopic on the astronaut's life, the team wanted a name that will not only suit the biographical film but also have a patriotic feeling attached. They had two names in mind - Salute and Saare Jahaan Se Achcha and they are going ahead with the latter. It makes more sense." Then Prime Minister Indira Gandhi had asked Rakesh Sharma how India looked from outer space and the astronaut had said, "Saare Jahaan Se Achcha." Therefore, the makers found it most suitable as a title for their film. So, fans already have something to rejoice even before Dangal is out!